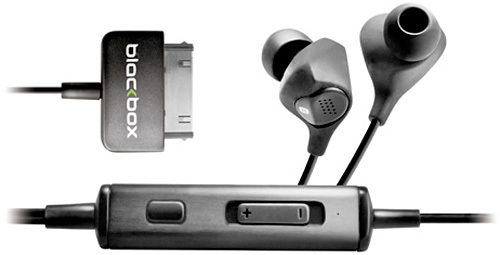 Blackbox i10 Noise Cancelling Earphones Powered By Your iPod/iPhone | OhGizmo! I like the idea of noise canceling earphones, I just don’t like the bulky in-line unit that handles the actual noise canceling bit. But as Blackbox shows, it doesn’t have to be so bulky if you can just eliminate the battery, which is what they’ve done with their i10 earphones. Instead of a standard headphone jack on the end, they’ve got an Apple 30 pin dock connector which allows the earphones to draw power from an iPhone or an iPod, so they don’t need their own battery. Of course on the flipside it also means the i10s will only work with Apple’s hardware, but I suspect that’s not a huge issue for a lot of people. The inline unit also allows you to control volume and turn off the noise canceling if you want to speak to someone and the earphones are available from Blackbox’s website for ~$125. I will be very interested to read reviews of these headphones. The only problem I see is since it takes over the dock connector, there is no way to charge the iPhone while listening to them.